What is a Community Video? Stories pass on information and evoke an emotional and physical response that make them catalytic tools for changing behavior. SPRING has introduced an innovative storytelling approach using community-developed participatory videos to promote high-impact nutrition and hygiene behaviors in India, Niger, Burkina Faso, Guinea, and Senegal. In the SPRING community video for nutrition approach, communities identify video topics, prepare the story, and produce videos starring local early adopters which are then disseminated by mobile pico projectors within peer groups for discussion. SPRING considers community media to be electronic media that is developed in the community, about the community, and with the community. India: In 2013, SPRING worked with Digital Green (DG) and partners to successfully promote nutrition behaviors through DG’s agriculture extension community video model. SPRING is currently supporting a randomized control trial—led by the London School of Hygiene and Tropical Medicine—to test this approach for promoting nutrition-sensitive agriculture practices. 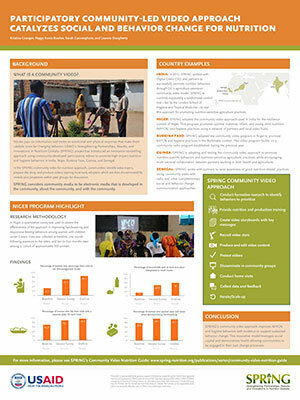 Niger: SPRING adapted the community video approach used in India for the resilience context of Niger. This program promotes optimal maternal, infant, and young child nutrition (MIYCN) and hygiene practices using a network of partners and local video hubs. Burkina Faso: SPRING adapted the community video program in Niger to promote MIYCN and hygiene practices in the Burkinabe context. This video program builds on a community radio program established during the previous year. Guinea: SPRING is adapting and testing the community video approach to promote nutrition-specific behaviors and nutrition-sensitive agriculture practices, while encouraging multi-sectoral collaboration between partners working in both health and agriculture. Senegal: SPRING works with partners to raise awareness of good nutrition-related practices using community video with radio and other complementary social and behavior change communication approaches. In Niger, a quantitative survey was used to assess the effectiveness of the approach in improving handwashing and responsive feeding behaviors among women with children under 2 years. Data was collected at baseline, one month following exposure to the video, and two to four months later among a cohort of approximately 300 women. SPRING’s community video approach improves MIYCN and hygiene behaviors with evidence to support sustained behavior change. This innovative model leverages social capital and democratizes health allowing communities to be engaged in their own change processes.